If you have stayed at the Buckhorn Inn, you know that breakfast is truly a highlight. Each morning we offer fresh coffee, biscuits and coffee cake right from the oven, fresh fruit, and a choice of a sweet or savory hot entrée. One of our newest breakfast dishes is chicken and waffles! Our new breakfast entree was a hit with this guest! Chicken and waffles is truly an American dish that draws both on soul food and Pennsylvania Dutch cuisine traditions. There are several theories about the origins of this dish. We do know that European colonists brought waffles to America in the 1600’s. When Thomas Jefferson bought a waffle iron in France in 1789, the popularity of the dish soared. One origin theory says that in the early 1800’s Philadelphia restaurants served waffles with fried catfish. Chicken gradually became more popular than catfish because it was available year round. The Pennsylvania Dutch enjoyed Sunday dinners of waffles, chicken and gravy. So much so that the dish became a symbol of Pennsylvania Dutch country by the end of the 19th century. Fried chicken and waffles came to Los Angeles by 1940’s. The dish was served at The Maryland and marketed as a Southern specialty. Interestingly, the combination of chicken and waffles does not appear in early Southern cookbooks. 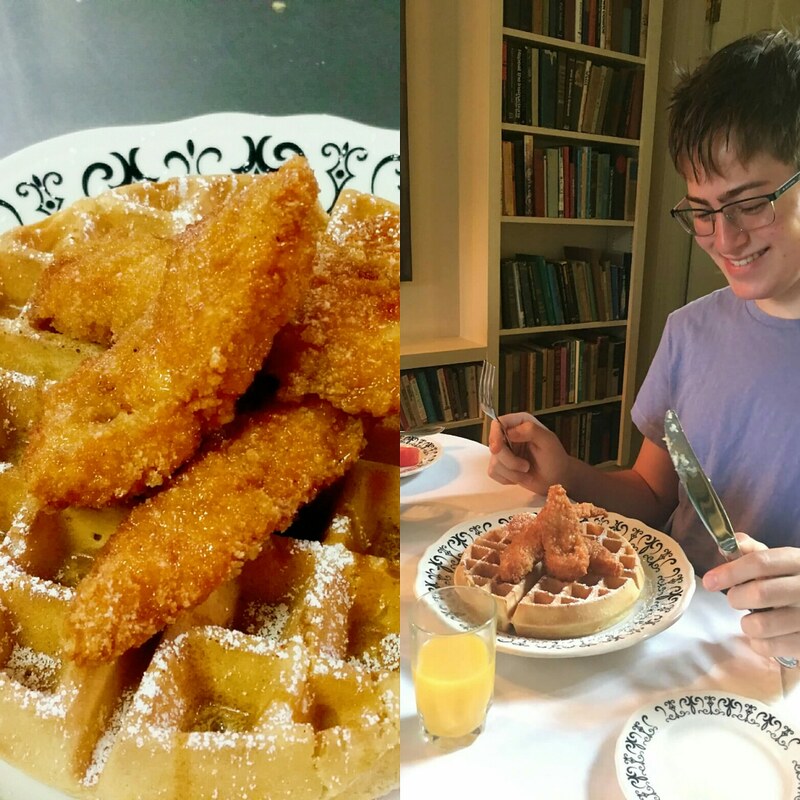 Whatever the origins of the dish, chicken and waffles has become a popular breakfast item at Buckhorn Inn. We make a light, fluffy waffle, top it with crispy fried chicken, drizzle it with a bit of Tennessee honey, and serve warm maple syrup on the side. What could make a better breakfast? Ice Cream Summer at the Buckhorn Inn! In 1984 President Reagan declared July the official National Ice Cream Month. At the Buckhorn Inn we are going further by celebrating this delicious treat all summer long! 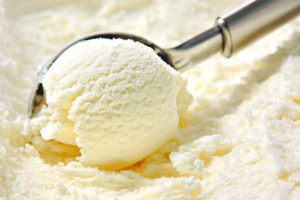 The International Dairy Foods Association reports that ice cream was enjoyed as far back as the 2nd century B.C. The “ice cream” of the time was snow and ice flavored with honey and nectar. Marco Polo brought a recipe for a frozen treat from the Far East back to Italy about a thousand years later. In the 16th century, Charles I of England was a fan of “cream ice”. 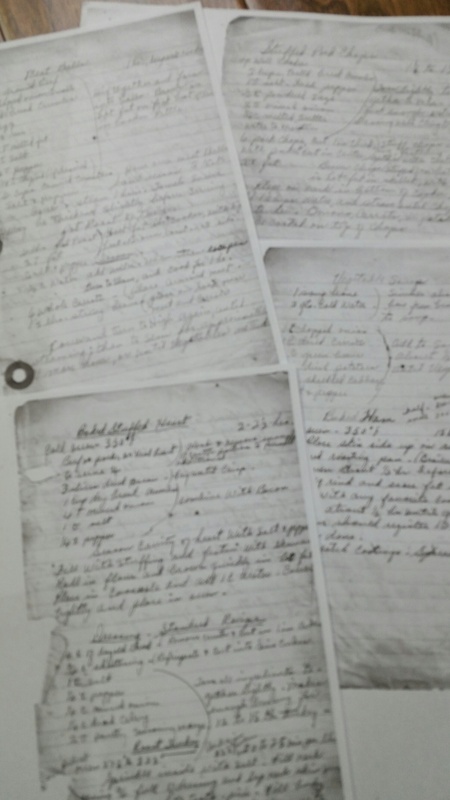 Lore has it that he provided the royal maker with a life pension in return for keeping the recipe a secret. In fact, royals around the world kept this delicacy to themselves. However in 1660 a café in Paris made a frozen blend of cream, milk, butter and eggs available to the general public for the first time. The Oxford English Dictionary reports that one of the first recipes for a frozen cream and sugar dessert in North America appeared in Hannah Glasse’s The Art of Cookery Made Plain and Easy in the late 1700s. http://www.archive.org/details/artcookerymade02glasgood Later records show that George Washington spent roughly $200 on ice cream during the summer of 1790. That was a large sum at the time–and most of us would agree that was a good expenditure! The invention of insulated ice houses around 1800 enabled the industrial production of ice cream. Today the United States produces more than 1.6 billion gallons of frozen dairy desserts a year! July 4 dinner guests at the Buckhorn will enjoy Chef Bob’s special creation, Strawberry Smoothie Cake! Upcoming menus will feature more delicious and decadent ice cream desserts like Mud Pie, Grasshopper Pie, and Peach Melba Pie. Keep an eye on our ever-changing menus to see the special desserts we are featuring all summer long! http://www.buckhorninn.com/dining We look forward to welcoming you to celebrate with us! Delectable fresh peaches are the star of Peach Melba Ice Cream Pie. Bumbleberry Season at Buckhorn Inn! 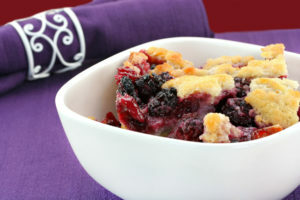 Dinner guests at the Buckhorn Inn on June 28 have a real treat in store–bumbleberry cobbler for dessert! Warm berry cobbler can’t be beat. You may ask how many bumbleberries it takes to make one cobbler? The answer is that there is no actual fruit called a “bumbleberry”. 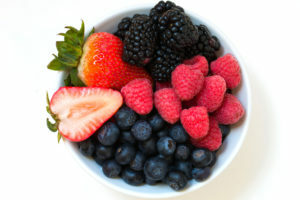 Rather, the word describes a mix of berries, or a “jumble” of berries. The delicious combination most commonly is used in a pie or in preserves. Typically the mix includes both sweet and tart flavors that burst into juicy goodness in your mouth. We bake ours into a cobbler that features a tender crust. Wikipedia credits Western Massachusetts as the home of the bumbleberry. 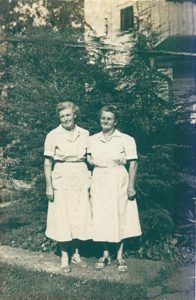 Lore has it that the name came from a waitress who was asked what kind of pie was being served. Bumbleberry recipes have appeared in print since the late 1950’s, and we argue that ours is one of the best. Cut cold butter into pats and line the bottom of a 6″x 9″x 2″ pan. Blend the flour and sugar. Add the milk and vanilla and stir to make a batter. Pour the batter into the prepared pan. Mix fruit together and pour on top of the batter. (Optional: if the berries are not sweet you may add 1/2 cup sugar to them.) Bake for 30-40 minutes until golden brown. The batter will rise to the top as it bakes. This recipe makes 10-12 delicious servings. Mixed berries are the basis for many summer treats at the Buckhorn Inn. Dinner guests at the Buckhorn Inn on May 30 will enjoy Red Velvet Cake for dessert. My personal history with this treat began when I was a child. Then it was known as “$200 Cake”. As the story I heard goes, a guest at the Waldorf-Astoria in New York City enjoyed her dessert so much that she asked the chef for the recipe. She received the formula and instructions, and $200 was added to her bill. She protested, but the chef replied that since she had seen the recipe, she must pay for it. She paid the bill, but exacted revenge by printing cards and passing out “the secret recipe” on New York City buses. 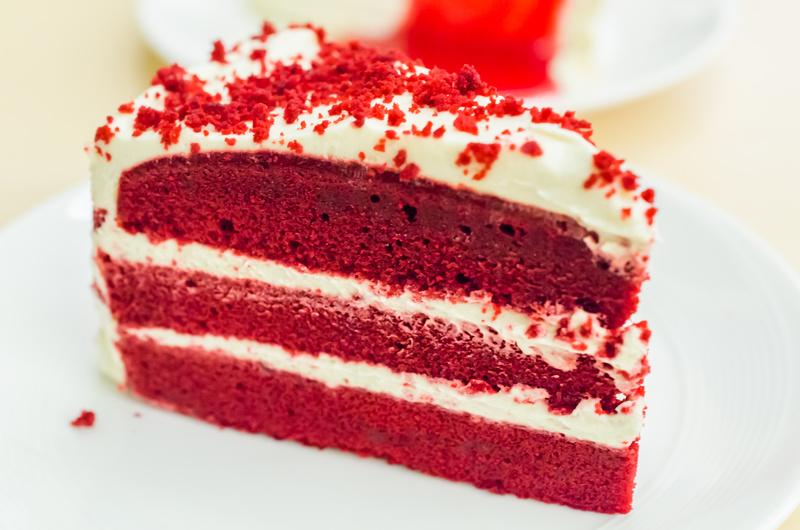 This story may or may not be true, but we do know a bit of the history of Red Velvet. Velvet cakes, so called because cocoa powder or cornstarch was used with the flour to create a fine-textured product, had been around since the 1800’s. But it was during the 1940’s that the Adams Extract company from Texas used point-of-sale recipe cards featuring their butter flavoring and red food coloring. 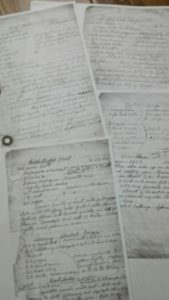 The recipe spread from Texas throughout the South. During the era of WWII food rationing, boiled beet juice was used to give the cake its brilliant coloring and help retain moisture. The dessert was popular at state fair baking contests and other bake-offs. 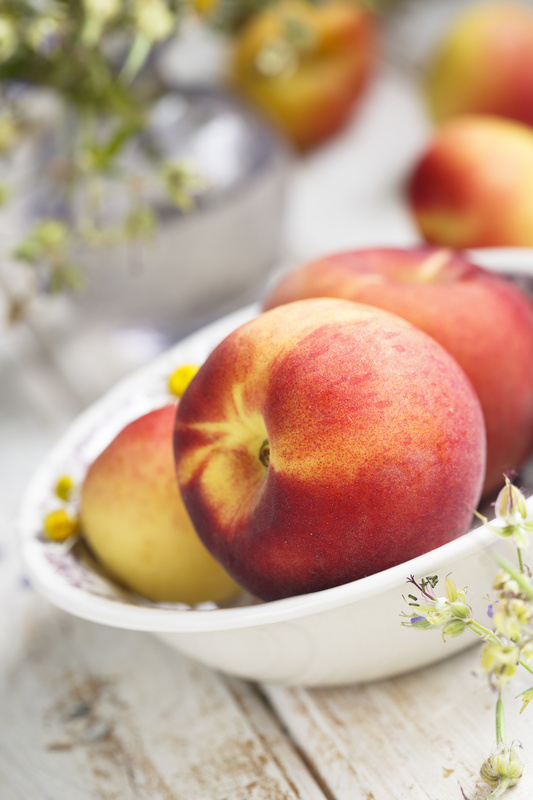 A cameo role in the 1989 film “Steel Magnolias” put this treat firmly in the modern spotlight. The Red Velvet Cake I remember from my childhood featured a boiled milk and flour frosting, called an ermine. It was very light and fluffy, but also very time-consuming to prepare. That may be one of the reasons that cream cheese frosting is the current favorite go-with. Whatever its origins, Red Velvet Cake truly is a delight! For a peek at our ever-changing menu, please visit http://www.buckhorninn.com/DINING/WEEKLY-MENU.